Laguna de los Condores Trek 3D. Three-day trek with multiple landscapes, wildlife, & unique archaeology. Interaction with authentic & welcoming Andean communities. Full day exploring the Lagoon of the Condors & its tombs. Includes visit to ‘Mummy Museum’ of Leymebamba. Amazing way to experience the pristine beauty of northern Peru! We start the day early in order to make the two-hour drive, in a private car, from Chachapoyas to the town of Leymebamba. Once in Leymebamba, we have breakfast in a local restaurant (not included) and then begin the day’s trekking, which will take approximately 10 hours. We provide horses which you can use to take you some or all of the way; and we make periodic stops to rest and enjoy beautiful views. After a break for lunch, we continue on our journey and eventually arrive at a small cabin, near the Lagoon of the Condors, where we have dinner and spend the night. We wake up early and have breakfast at the cabin. We then hike for an hour to get to the beautiful Lagoon of the Condors, where we have time to relax and take photos. The lake is a geological formation located at the head of the Chilchos Valley, at the watersheds of the Marañon and Huallaga rivers. We then take a small boat across the lagoon, in order to begin a one-hour hike up to the mausoleums of the Chachapoya culture. 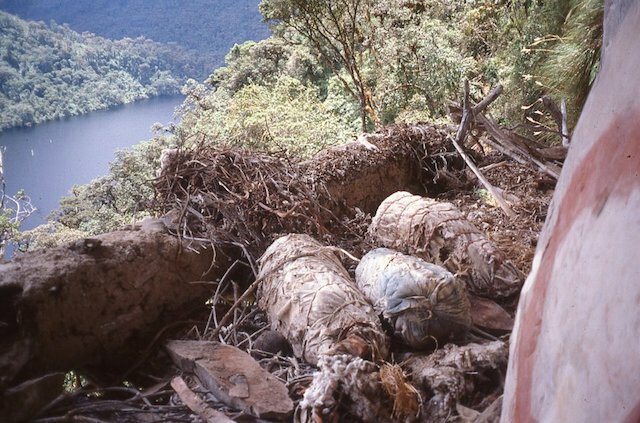 Mummies at Laguna de los Condores, as they were discovered. It was only in 1997 that a group of local farmers uncovered this spectacular burial site on a cliff overlooking the Lagoon, consisting of six burial towers, hundreds of mummies, and thousands of artifacts. The guide will show us around the site, explaining the interesting aspects of the mausoleums - which are decorated with zigzag friezes painted in white or red and yellow ochre - and the people who built them. After the tour, we hike back down to our boat and spend the rest of the afternoon relaxing, birdwatching and fishing. Just before the sun sets, we head back to the cabin, for dinner and overnight. After breakfast at the cabin, we will make the 10-hour hike back to the town of Leymebamba. Once here, we visit the remarkable Leymebamba Museum, which was constructed to preserve the 219 mummies and 2,400 other artifacts recovered from the Lagoon of the Condors in 1997. After the museum visit, we return to Chachapoyas by private car. Our services end in Chachapoyas. 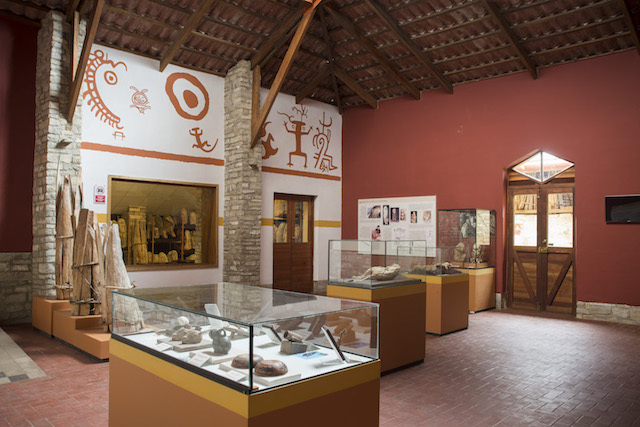 Leymebamba Museum, home to the mummies & artifacts from Laguna de los Condores. 2 nights accommodation in basic cabin.